00:06 We've used stack views a lot, especially for prototyping, as they're very convenient for quickly throwing together some views. 00:36 However, since we're setting our views up in code (see the Connecting View Controllers episode for one reason why we're doing this), we still have to write quite a bit of boilerplate code to set up a stack view. As such, it would make sense to create an abstraction to simplify this process. 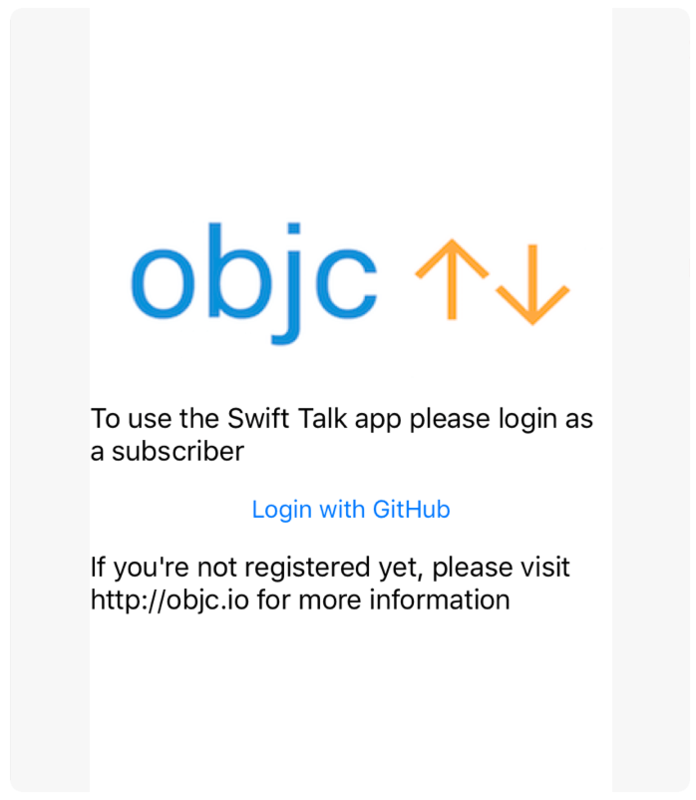 text1.text = "To use the Swift Talk app please login as a subscriber"
text2.text = "If you're not registered yet, please visit http://objc.io for more information"
01:33 For the image, we use playground's image literals, which are super convenient for quickly loading an image from the playground's resources. 01:51 The button is not yet hooked up to an action, but we'll take care of this later on. 02:12 While using a stack view like this is really convenient because it handles all the layout for you, it's still a lot of code to write. 02:38 There's also a lot of duplication when creating the views, like setting the numberOfLines property on UILabel — especially since most of the labels in our app will be configured very similarly. 03:29 Now we could build a description of what we want to show using ContentElements and then somehow convert them into views. 03:38 Before we do that though, we have to remember that the button case still needs a way to associate an action with it. We'll look at this at the end. 06:15 In the image case, the code hasn't improved considerably. 06:27 The setup of the labels and the button is a bit nicer though. 07:03 Overall, it's a modest win, but there's much more we can do with ContentElements. 10:59 To remove even more code, we can create an entire view controller that is initialized with an array of content elements. 11:20 This way, we avoid repeating the steps that are still necessary in the view controller's viewDidLoad method. 13:03 The resulting view is still the same as what we started with, but the code to create it is short and descriptive. 13:17 An abstraction like StackViewController allows us to quickly prototype a screen. This is useful for communicating with other people involved, and we can always make it look nice later. 14:29 However, getting this callback to work with UIButton is a bit problematic. 14:41 We could try to subclass UIButton and keep a reference to the callback there, but that doesn't work too well. 15:04 For example, the documentation of the initializer UIButton(type:) tells us that it won't return an instance of a custom subclass, so subclassing is a bit fragile, and it gets tricky to do it right. 18:49 The CallbackButton class is kind of a crutch, because we have to bridge UIKit's target/action mechanism to our button callback. But at least it works and it's safe. 19:35 We ended up with a very declarative way of building our stack view, which we've found to be a helpful prototyping tool. 20:05 We can extend our implementation in a few obvious ways in the future — for example, by adding a custom case to display arbitrary instances of UIView. 20:18 Adding an asynchronous case would also be interesting. This could give us a chance to load data from the network and swap the view in once the result comes back. 20:27 On the other hand, adding more and more cases will make this simple abstraction increasingly more complicated. 20:32 As a result, we might just end up implementing it for all of UIKit, so we should stick to the things we really need for our project. 20:52 Another interesting use case for this abstraction could be to construct the view hierarchy out of data we receive, e.g. from the server. 21:06 We could easily transform a JSON dictionary into ContentElements and build a StackViewController on the fly. 21:27 There are many interesting possibilities, but even in this simple form, the abstraction helps us iterate faster and write cleaner code.